I LOVE COOKBOOKS AND HAVE A COLLECTION OF DOZENS. I USUALLY HAVE SOME GUIDELINES TO DETERMINE WHY I BUY ONE: IT MUST HAVE AT LEAST THREE TO FOUR RECIPES I AM IMMEDIATELY INTERESTED IN WHEN I FIRST OPEN THE BOOK AND HOW USER FRIENDLY IS THE BOOK. 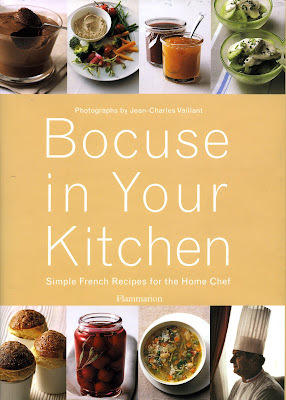 (NUMBER OF INGREDIENTS, DESIGN, PHOTOGRAPHY ETC..) THIS BOCUSE BOOK IS A HOME RUN. FIRST PUBLISHED IN 1982, THIS NEW EDITION IS UPDATED FOR THE TWENTY-FIRST CENTURY. BOCUSE COVERS EVERYTHING FROM A SIMPLE MAYONNAISE, POT ROASTED CHICKEN AND CREAMY SCRAMBLED EGGS TO POTEE AU CHOU (SIMPLE PORK DINNER) AND RABBIT PATE. THIS IS NOW A STANDARD "GO TO" FOR ME WHEN LOOKING FOR DINNER INSPIRATIONS.